M.Ch - Cardio Thoracic Surgery, MS - General Surgery, M.B.B.S. 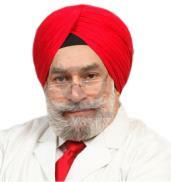 Dr. Inderjit Singh Virdi, MBBS, MS(General Surgery), M.Ch (Cardiothoracic Surgery), FRCS (Edinburgh), FRCS (C/th), FRACS (Australia), is the Chairman of Alchemist Hospital, Panchkula & Gurgaon. He is an internationally renowned adult and pediatric heart & lung surgeon having performed over 10,000 such operations. Dr. Virdi after accomplishing his basic medical studies (MBBS), pursed Post Graduation in General Surgery from Government college, Patiala. Succeedingly, he achieved his super specialization, M.Ch (Cardiothoracic Surgery) from world famous PGIMER, Chandigarh. Thereafter, he proceeded to England to join the British Heart Foundation as Fellow in Cardiothoracic Surgery. He achieved his FRCS from Edinburg University & also FRCS in Cardiothoracic Surgery from the Inter Collegiate Board. Ensuing this, he travelled to Sydney, to join Australia Heart & Lung Transplant Unit at St. Vincent’s Hospital. Besides gaining expertise in the surgical management of terminal heart & lung diseases, he obtained his fellowship of the Royal Australian College of Surgeons (FRACS) as well. Also, he got formally trained in Robotic Heart Surgery. To his credits, Dr. Virdi has contributed to scientific research majorly revolving around myocardial preservation. He in collaboration with the team of scientists from the James Cook University, is currently involved in a research programme for developing a new Cardioplegic Solution for arrested heart surgery & stabilization for Beating Heart Surgery. Over and above, Dr. Virdi has published many articles in several peer reviewed journals in the domain of his medical expertise & has trained many cardiothoracic surgeons across the world. ***Lost a loved one because of this idiot at Max Saket. This guy was banned to work in Australia so he is practising on us.